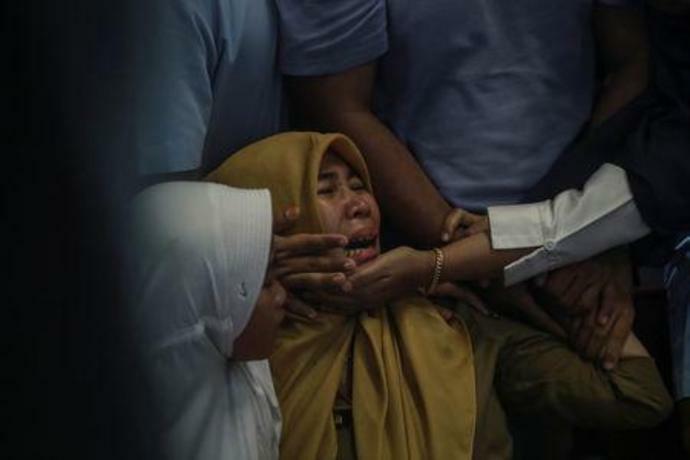 PAKISJAYA, Indonesia (Reuters) - An Indonesian aircraft with 189 people on board crashed into the sea on Monday as it tried to circle back to the capital, Jakarta, from where it had taken off minutes earlier, and there were likely no survivors, officials said. Lion Air flight JT610, an almost new Boeing 737 MAX 8, was en route to Pangkal Pinang, capital of the Bangka-Belitung tin mining region. Rescue officials said they had recovered some human remains from the crash site, about 15 km (9 miles) off the coast. Indonesia is one of the world's fastest-growing aviation markets, but its safety record is patchy. If all aboard have died, the crash will be the country's second-worst air disaster since 1997, industry experts said. The pilot had asked to return to base (RTB) after the plane took off from Jakarta. It lost contact with ground staff after 13 minutes. "It's correct that an RTB was requested and had been approved but we're still trying to figure out the reason," Soerjanto Tjahjono, head of Indonesia's transport safety committee, told reporters, referring to the pilot's request. "We hope the black box is not far from the main wreckage so it can be found soon," he said, referring to the cockpit voice recorder and flight data recorder. Search and rescue agency head Muhmmad Syaugi told a news conference earlier that no distress signal had been received from the aircraft's emergency transmitter. Yusuf Latief, spokesman of national search and rescue agency, said there were likely no survivors. At least 23 government officials, four employees of state tin miner PT Timah and three employees of a Timah subsidiary, were on the plane. A Lion Air official said one Italian passenger and one Indian pilot were on board. The plane went down in waters about 30 meters to 35 meters (98 to 115 ft) deep. Items such as handphones and life vests were found, along with the body parts. Ambulances were lined up at Karawang, on the coast east of Jakarta, and police were preparing rubber dinghies, a Reuters reporter said. Fishing boats were being used to help search. Edward Sirait, chief executive of Lion Air Group, told reporters the aircraft had had a technical problem on a flight from the resort island of Bali to Jakarta but it had been "resolved according to procedure". Sirait declined to specify the nature of the issue but said none of its other aircraft of that model had the same problem. Lion had operated 11 Boeing 737 MAX 8s and it had no plan to ground the rest of them, he said. The accident is the first to be reported involving the widely sold Boeing 737 MAX, an updated, more fuel-efficient version of the manufacturer's workhorse single-aisle jet. Privately owned Lion Air said the aircraft had been in operation since August, was airworthy, with its pilot and co-pilot together having accumulated 11,000 hours of flying time. Safety experts say nearly all accidents are caused by a combination of factors and only rarely have a single identifiable cause. The flight took off in clear weather at around 6.20 a.m. and was due to have landed in Pangkal Pinang at 7.20 a.m.
Distraught relatives of those on board arrived at the airport in Jakarta and Pangkal Pinang. "Be patient, pray the best for papa," one woman arriving at Jakarta airport told a sobbing girl. The woman declined to speak to reporters. President Joko Widodo told a news conference authorities were focusing on the search and rescue, and he called for the country's prayers and support. The effort to find the wreckage and retrieve the black boxes represents a major challenge for investigators in Indonesia, where an AirAsia Airbus jet crashed in the Java Sea in December 2014. Under international rules, the U.S. National Transportation Safety Board will automatically assist with the inquiry, backed up by technical advisers from Boeing and U.S.-French engine maker CFM International, co-owned by General Electric and Safran. Boeing was deeply saddened by the loss, it said in a statement, and was ready to provide technical assistance for the investigation. Data from FlightRadar24 shows the first sign of something amiss was around two minutes into the flight, when the plane had reached 2,000 feet (610 m). It descended more than 500 feet (152 m) and veered to the left before climbing again to 5,000 feet (1,524 m), where it stayed during most of the rest of the flight. It began gaining speed in the final moments and reached 345 knots (397 mph) before data was lost when it was at 3,650 feet (1,113 m). Indonesia's worst air disaster was in 1997, when a Garuda Indonesia A300 crashed in the city of Medan, killing 214 people. Founded in 1999, Lion Air's only fatal accident was in 2004, when an MD-82 crashed upon landing at Solo City, killing 25 of the 163 on board, the Flight Safety Foundation's Aviation Safety Network says. In April, the airline announced a firm order to buy 50 Boeing 737 MAX 10 narrowbody jets with a list price of $6.24 billion. It is one of the U.S. planemaker's largest customers globally. DETROIT (AP) - A global team of experts next week will begin reviewing how the Boeing 737 Max's flight control system was approved by the U.S. Federal Aviation Administration. United Airlines expects Boeing Co's grounded 737 MAX jets to return to service this summer, with deliveries resuming before the end of the year, an executive said on Wednesday, reassuring investors concerned about a prolonged suspension. The 737 MAX was grounded worldwide in March following two fatal crashes, forcing Boeing to freeze deliveries. Boeing is under pressure to upgrade the software and convince global regulators that the plane is safe to fly again, a process expected to take at least 90 days.